Welcome back. It’s been a little over a month since I wrote an article, and mostly because I was in a serious magic rut. The problem was that I couldn’t find a red deck that I liked that was worth its salt; no matter how hard I tried I kept banging my head against the wall and losing match after match in testing. I hate to bring an article to my readers trying to convince them to play a deck if I myself don’t believe in it. When I play Red, like I hope is the case for many of you, I play with the belief and intent that I can beat any deck in the field, and most of the time I don’t want to think there’s a bad matchup out there. But this simply wasn’t the case and I hung up the tourney scene for a while until something came out that caught my interest. The Pro Tour Qualifier Season for Journey into Nyx has begun though, and if you want to play the game and see the world, you better start by actually playing. Resolved to play Mono Red, I broke down and bought 4 Nykthos, Shrine to Nyx, 4 Stormbreath Dragon, and 4 Temple of Triumph. 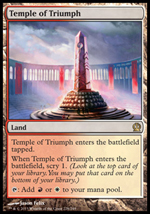 Despite having a little white in my lands, I was still going to play Mono-Colored and just use the temples to add filtering to my deck. I realized that there were some excellent cards worth playing in White, but that required even further investment into Sacred Foundry and a few additional rares and I wanted to see if staying streamlined was still possible. I tested online for a week fairly regularly and had mixed results, but using Burning-Tree into Nykthos certainly allowed for some explosive starts and maindeck Act of Treason threw off a lot of opponents. I then brought it to my local shop’s Tuesday Standard Win-A-Box and gave it a more proper test run. UW Control Round 1: Loss. I even Act of Treason’d an AEtherling that he tapped out for, but sadly couldn’t come back in that game or the next. The deck didn’t feel like it had a lot of permanency despite being on a devotion plan. It also had really awkward and clunky draws with 25 lands and the use of scry lands as the only filtering outside of Chandra, Pyromaster. Round 2 was against Mono Blue Devotion, and while the games were closer, Thassa and Master of Waves wrecked me for the umpteenth time. I won my last two rounds and a few packs, but at that point I could pretty much care less. It’s amazing what that card does to this deck. I didn’t want to betray my loyal Mono Red followers and roots, but at the end of the day this deck is still very much red aggro and this card single-handily turns the tide of critical tier 1 matchups. It’s not that you can’t create a similar effect with Red cards (although it’s pretty tough) but its that it’s just so efficient and such a permanent answer to the most difficult things for the current red mage to deal with that it ends up being a huge difference in your winning percentage. Sure, you could just play a Tom Ross style Red aggro deck (for those who haven’t been reading his recent articles on StarCity there is a link to his first one on the Pages section of my website) and swarm around big threats, but ultimately that strategy has a lot of potential pitfalls that are game-breaking in a large tournament. For starters, that strategy has such a low land count that you have to mulligan very aggressively and accurately and even with that just know that you’re going to get some terrible draws at times, possibly when it matters the most. Granted, Mono Red Aggro in general might suffer from that syndrome, but it’s an even more heightened situation with that few of lands. His newest R/G version which I encountered tonight uses some scry lands which I found interesting, but time will tell how far it goes. You also are a deck that is very conditional on whether or not your opponent has sweepers or threats that prevent you from getting through, both of which are very realistic scenarios in a Standard environment cluttered with Anger of the Gods, Golgari Charm, and Supreme Verdict. I’d rather play a more controllish build. We saw the impact Big Red had on the waning days of the previous Standard season, and that deck really never lost much. Thundermaw Hellkite became Stormbreath Dragon, and the difficult G/R matchup is now much better with access to cards like the big white one mentioned above. That’s not even addressing cards like Purphoros, God of the Forge, Fanatic of Mogis, and Hammer of Purphoros which all add another layer of difficulty for decks that want to play midrange with you. The lists that have been doing well online (which mine was mostly based off of) have been placing in Top 8s but haven’t won many of them. I think part of the problem is certainly that the two biggest boogiemen, Mono Black and Mono Blue, have a variety of weapons against you AND most of the R/W lists are too streamlined. 90% of the R/W lists I’ve seen have 6-8 removal spells if that and not nearly anywhere the amount of draw-power that the Mono Black list has nor the sweeping respect needed for Mono Blue. Can it beat those decks? Sure, you still have a lot of weapons, but you should be gearing the deck specifically to beat those two archetypes. I really don’t mind shaving a few percentage points or a lot of them in this case because Standard is homogenized enough right now that you can afford to do it. Sure, there’s 8-10 archetypes out there that are fairly competitive, but those archetypes are mostly not looking for a game with Mono Red. These are the key players that you’ll see the most online, although the notable absence from the majority of the builds I see is Magma Jet. Honestly, of the five you see above, I think it’s the best and the most important. The stock lists online have so little interaction in the early game. Are you going to be playing your devotion cards to build up to a big finale? Yes, but sometimes you won’t be able to execute that game plan if you’re behind, sometimes you’ll get Thoughtseize’d, and other times you just need to dig for one of the key cards in the deck. Magma Jet helps with all of this. People frequently give it the knock because they say there’s not a lot of two-toughness creatures in the format, but if you think about it for a while, there are some very important ones. For starters, there’s Pack Rat, Tidebinder Mage, Ash Zealot, and Scavenging Ooze, all of which are cards I’d hate to waste a Mizzium Mortars and Chained to the Rocks on. And in all honesty, you don’t have the ability to waste the latter cards on these creatures because playing them on targets like Frostburn Weird, Desecration Demon, Thassa, Master of Waves, etc, is a must if you want to win those matches. 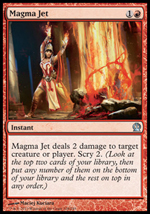 Furthermore, Magma Jet is another Burning-Tree Emissary target in a deck that is already at an all-time low for them. Playing BTE into Jet simply just to fix your next few draws is often game-breaking in many situations, specifically so in a deck that’s packing x4 Fanatic of Mogis and x4 Stormbreath Dragon. I often found before that getting to Stormbreath Dragon mana could be a chore at times, but having eight scry effects in the deck changes this a decent amount of the time. So what’s usually in the place of Magma Jet? Purphoros, God of the Forge, Hammer of Purphoros, and Chandra, Pyromaster are all the usual suspects. None of these are bad, and the deck might want singletons or possibly more of each of them, but the problem is they are very matchup specific and none of them are a must-have card against any matchup in particular. Purphoros is nice as a giant threat the opponent has to take care of, but he’s in a relatively light creature deck here and his ability to be a creature is conditional which anyone who’s used Vexing Devil knows is a big issue for a card to have. When facing a deck like Mono Black, which often has x4 Devour Flesh, x4 Hero’s Downfall, and some number of other removal spells, I see them cutting the rug out from under me more times then I’d care to. Against Control, he’s an excellent pressure point for them to deal with, but I’d argue that he’s not as good as something like Assemble the Legion or Hammer, which basically says kill this immediately or you die. Hammer of Purphoros is good in most matchups. There’s few decks that can deal with a continual stream of colorless 3/3s, giving haste to the creatures you do have like Reckoner and Fanatic is a big deal not to be overlooked, and the added devotion at three is very nice. But sometimes in Midrange matchups you really don’t have a time when it’s appropriate to play a Hammer. You need action in a lot of those situations, or you need a specific out. Hammer just simply does its own thing. 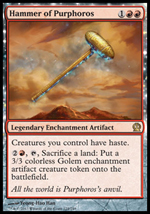 I’ve had too many games of staring down an Elspeth with loads of tokens on the board only to have a Hammer that is sitting there wishing it was anything but itself. I think because it is really good at putting pressure on *most* decks that it’s perfectly reasonable as a 1-2 of in your 75, but it’s a hard sell for me as a heavy maindeck card. 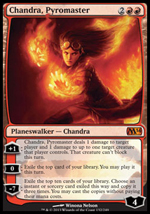 When I was running the Mono Red Nykthos list I played a full playset of Chandra. That might sound excessive, but I figured that she was going to die most of the time she saw play or that if she didn’t I wouldn’t mind having one in hand since the one in play was probably winning me the game. I thought that her “can’t block” clause was pretty significant in a format full of midrange creatures and decks that like to consistently trade blows rather than sit back on defense. Usually as a Red deck, even a controllish one like this, you are the aggressor, so having the ability to make sure you get some big guys through is clutch. This is not even mentioning that you’re the devotion deck playing Fanatic of Mogis which you can usually rely on to leap frog a life-total war. Some of the problems with Chandra though lie in her casting cost and her +1 ability. For starters, she’s another four drop in a deck that’s very top-heavy, and while that worked in the previous season and still works today, I find the deck has less ways to draw out of bad hands or land-limited hands than the Mono Black and Mono Blue decks do. You don’t have x4 Underworld Connections, and you don’t have the curve that Mono Blue does. It’s just simple math, they’re going to have a higher percentage to deal with the same bad draws that you get than you are. This is one of the big reasons why I think some number of Magma Jet needs to be in the R/W list. As for the +1 ability, it’s really nice but sometimes it runs into the same problem I mentioned above for Hammer of Purphoros; it just doesn’t accomplish what you need to do. Sure, in those situations you could use her “0” ability, but you won’t always have the time or open mana to use that to full effect. 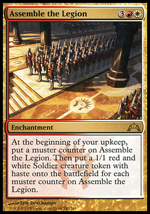 Assemble the Legion is great, we all know how powerful that card can be. The only matchup I wouldn’t want it against is hyper-aggro, and even then it can be a total game-over card if you manage to stall them in the early game. Enchantment hate is criminally underused in Standard and has been for a very long time, so any time you can put an effect this powerful in your deck and it’s on an enchantment I say give it a try. The Mono Black and Mono Blue decks especially seem to have limited answers to it outside of Thoughtseize and Aggro Beats, so that again brings the point of the cards in the deck back to the original focus I mentioned. The biggest threats for R/W Devotion seem to be a good Control player wielding a well thought out list and an Aggro player who gets one of their typical consistent openers. 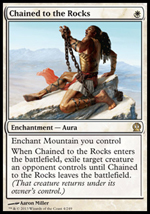 The R/W deck makes a large amount of concessions to Control in game 1 because of the maindeck answers for Midrange decks such as Mizzium Mortars and Chained to the Rocks. I almost never build a red deck with dead cards in it, but in this limited Standard format it feels like a necessary evil. 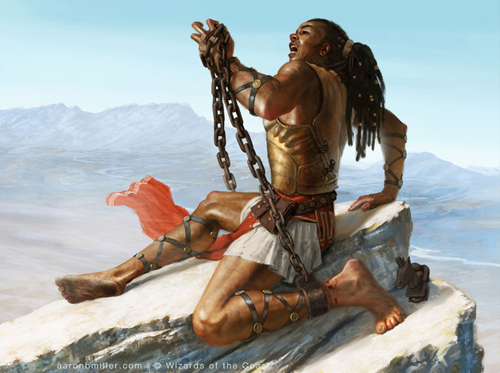 Playing without Chained to the Rocks is basically pure game 1 suicide against the biggest decks in the field, so unless you expect a swath of Esper and American at your next tournament, I’d keep the number high. Mortars is more or less disposable but it again has important targets in the metagame. So in order to combat the weakness to Control, I think you need to either have a heavily devoted sideboard against it or you need to include some of the fattier singletons I mentioned above like Hammer of Purphoros. Boros Charm and Skullcrack both answer the biggest threats against you (Supreme Verdict and Sphinx’s Revelation), and if you can find room Burning Earth is still as good as it ever was. Assemble the Legion again is yet another threat in the long chain that you can pile on with. You’ll have limited slots, but I’d say at least eight of them should be able to be substituted against Control, or at least an equal number to the number of dead cards in the main. One thing to be wary of is that this deck isn’t applying pressure like a pure Red Deck Wins archetype, so having too many top-heavy threats or too much lack of permanency can get you easily behind against a deck that is prepared to counter you at specific points and then drop cards that you have limited answers to (cough*Elspeth*cough). Against Aggro, or even the mirror, it’s easy to simply get overrun. In game 1 you have no sweepers outside of a Nykthos into an overloaded Mortars (or just a hard cast one), and even though you have great blockers like Frostburn Weird and Boros Reckoner, cards like Madcap Skills can just give you headaches. There’s also not enough maindeck burn to give you the critical threshold of spot removal to guarantee seeing it often enough, so overall this might be asking R/W to make changes. For starters, the Magma Jet plan goes a long way, but I also supplemented this out of the board with Warleader’s Helix. I’m not 100% sold on this plan though, as it is a costly card that you may not get to in time (as one of my teammates also brought up tonight in the build he’s testing) but it is great in the mirror and can swing the tide of any game that it sees action. It can also deal with the pesky 4-toughness threats that seem to dominate Standard at times. Sure, you have Mortars for those threats, but there’s often many times where you need multiples of this type of effect. Lastly, going four to the dome and gaining some extra reach is something that any devotion deck is severely lacking, so anything you can do to strengthen that weakness cannot be overlooked. Anger of the Gods to me is the best answer at the moment for the variety of Aggro out there. At first I tried Ratchet Bomb and Electrickery, and I think they’re fine as supplements, but they’re just a bit more narrow then what you need in Standard. Anger kills the majority of the cards that present problems to you, and it cuts off devotion counts immediately unlike waiting for a Ratchet Bomb. Sure, Ratchet Bomb can kill Master of Waves tokens at zero, but if you’ve played heavily against Mono Blue Devotion you know their board states can often be a variety of casting costs. I don’t like that Anger can be delayed by Judge’s Familiar, or that it misses Frostburn Weird and Thassa, but you have other answers for those cards and I’ve found that if you disable the other threats around them those cards tend to be very incapable of winning a game on their own. Against more true Aggro like the W/R deck, you basically just have to play around Brave the Elements and if you’re able to one Anger is typically game over. Playing Anger and then dropping a Boros Reckoner or a Stormbreath Dragon is a really difficult sequence for the majority of your opponents to deal with. One notable omission in my sideboard tonight was Wear // Tear. It was just a simple last minute mistake, I meant to run two of them, and I think the card is great. My teammate was reminding me of some of the great uses of it, and just for those who haven’t been considering it I’ll recap some of them; it kills Underworld Connections, Whip of Erebos, Bestows, Bident, Detention Sphere, Assemble the Legion, and Chained to the Rocks. That’s a really solid laundry list of some of the top threats in Standard and it’s not even anywhere near all of them. The latter cards I mentioned also reminded me of how bad it is to have those killed on your own side, so make sure you’re conscious of matches where your opponent is going to side in enchantment hate. In one match tonight I even next-level’d it and sided out a few Chained to the Rocks for some Warleader’s Helix’s just to avoid getting boned by a Destructive Revelry or the like. I’ve seen that card a lot online out of G/R Devotion, and it’s typically the absolute worst. One more thing about Aggro – this deck may or may not want some number of Shocks. Just a random aside that I’m not sure on yet, but it could help defend against some of the crazy nut draws that are out there at the moment.